This is just an end of year gathering of ramblings that I hope entertains. The internet is pretty quiet over the Christmas period, so I have put this together to give a bit of a read for anyone who fancies a bit of wargaming 'time out'. 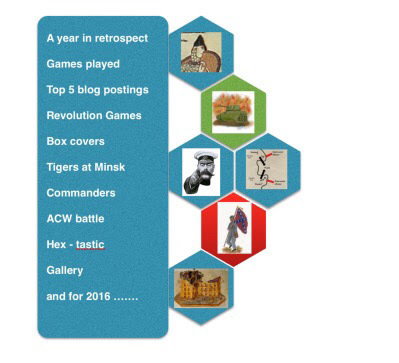 It includes a new scenario the Tigers at Minsk rules and looks at my wargame calendar for 2015. The PDF can be downloaded from my DropBox account (thank you Dropbox). If you don't have a dropbox account and don't want one' you can just click past (by cancelling the pop up window) their registration screen to get to the download button. I do like reading retrospectives. In the spirit of you calling for people to just stop every now and then and comment, I will do so. Firstly, thank you for blogging. I think I have been following your blog from near the start and enjoy reading your posts. I am not surprised the comparison post is so high – I think people cannot get enough of them! And the pinboard one is of course one that I whole heartedly agree with – 10 years ago there were only a few miniatures rules for small tables, DBA being one that stood out for me as a leader. Now there are lots, which is great and you have done your bit to help that happen. Do not panic about the larger scales - I sometimes think you cannot be a gamer unless you have at least two different scales in the drawers, and really a minimum of three should be the qualifier. Although I really like gaming on small tables, the look of larger figures and tables is a big drawcard, especially as the eyes get older. I have read your rules (they look great) but have not played them  as I got caught up in playing and testing out my own WW2 rules. I played lots of hex boardgames in the 80s and 90s and, unlike you, If see hexes on the table with miniatures it just does not seem like a miniatures game, more like a board games and there should be cardboard counters or blocks or cheap plastic figures (like Memoir’44). I do realise it is conditioning  and I need to break it, just have not seemed to yet! I can handle squares and miniatures, just not hexes (it does not have to be a logical conditioning). I have also tried, unsuccessfully, to play some boardgames solo in the last 3 years but I cannot get enough of miniatures and keep playing them instead! Anyway, good luck with settling in your new home, Stamford Bridge hope the Christmas was good and the New Year will be. Here’s to blogging and gaming in 2016! Hi Shaun, thanks for your thoughts and comments. The house move is more demanding than I thought, so active gaming will be pushed further back, but when it returns, I think it will be better in the new place. It was your favourable comments about 20mm that propelled me increasingly in that direction and I probably have enough to put on a small game now (once painted!). Best wishes for the New Year. Norm. Not surprisingly, as Norman's long-time friend and opponent [the ftf Mike mentioned in the calendar of gaming element of this Christmas package! ], great to settle down and digest a plum-pudding of a read. Never quite sure how you manage to do all that you do, particularly the painting and production of scenery to a standard way beyond my very limited capacity. The cityscape used in our WWII battles and the Alien confrontation just has to be seen to be appreciated and your calendar that includes all we've played through during the year has certainly inspired me to record my own thoughts. 2016 should prove another fascinating year with No Retreat Italy and more than any other anticipated session, Storm Over Normandy bidding for early place on the game's table at my end, while the new house starts to develop. Hi Mike, thanks for another year of great gaming, looking forward to an early go of Stoirm over Normandy. Looking forward to 'unboxing' my kit once we get a few rooms sorted. Yes, it is all coming together. I have been buying a few items just to have them on the desk to browse at while everything is in boxes. I have Black Powder (again), some MDF buildings and yesterday I bough Mars Attacks boardgame, a big deviation for me, but looks fun (miniature / boardgame cross), but interestingly it uses squares, so that Is something for me to explore, with even some thoughts about moving it to me hex terrain. hope your work schedule lightens this year to give you a bit more quality 'creative time'. Hi Norm, Nice to hear that you are making progress. I've had a look at Mars Attacks and think it has some mileage. The US Troops are very usable for current day conflict as is the flatbed truck. I'll be interested to see what you think. congratulations on your second Boxed game release and i hope you had a great Xmas period. Thanks Mark, I like your graphics update on your game. Thanks for signing up to blog. Hopefully life will start to settle soon so that I can start getting productive again. Norm. Looks like you had well varied diet of games last year. As for my 2015 it was mainly tactical as usual, my most played were ASL, Combat Commander, & Conflict of Heroes. I have Ghost Pzr. & GMT's Panzer in waiting. My big spend for the year was The greatest day: Sword..... Our intension is to play it at the Second chance games weekend in November. The deviation I took was Star wars Imperial assault, I'm already hook, line & sinker into X-wing. Finished year off with con. of Heroes Solo expansion, which I highly recommend. A feller of your design skill will be stitching the order cards into game systems. Hope you get house sorted quick, there is nothing worse than not being able to get hands on a rule book ! Hi Gareth, that looks like a good WWII tactical mix. I want to do more WWII tactical this year, the choice is huge I have Compass Games battle for France 1940 in the wings, but it keeps getting squeezed out. I played my first wargame for 2016 a couple of nights ago at Mike's. He had the new MMP Storm over Normandy game on the table. I lost as the invader, but had a thoroughly good game, looking forward to getting back to it soon. the house is hard going, we now have heat but over past three days have been getting a re-wire, so everything firmly still stashed away in boxes. I bought the Warlord Hail Caesar rules the other day just to have something in my hands. While a nuisance, mine is just an inconvenience as my lot is so much better than all the poor souls in the UK who have been flooded over recent weeks, my heart felt sympathies go to them. Thanks to all who have commented on this post. Norm.